March madness is here! We are talking snow not basketball. March is the snowiest month of the year in Colorado. Metal roofing is ideal for managing heavy snow, plus it looks great! 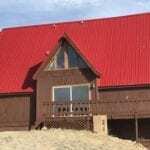 Denver metal roofing choices are varied. There is the classic “standing seam” metal roof, similar to the picture in this article. There is stone coated steel with an entirely different look also. As well, you have many color options. The classic colors are dark green or red but there are many other choices today. The other beauty of a metal roof or steel roofing, besides it’s look, is it’s durability. A well maintained metal roof can literally last generations. It’s look is timeless and it’s long term functionality can be also. If you are considering metal for your roof, give us a call for a free inspection and estimate for your project. We can show you the many options to consider and help guide you through the process of choosing a roof that will be both beautiful and manage the snowy March madness of Colorado.